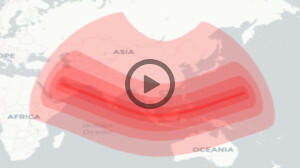 Where are the best spots to see Annular Solar Eclipse in India? The best places to see annular eclipse in India lay in the center area marked on the map by the darkest red color (see the map below) - this is the place where the annularity duration is the longest. So, if you want to experience the longest annularity duration (more than 3 minutes), you should observe the eclipse from those locations e.g. Tiruppur, Tamil Nadu - annularity 3:11. The best place on the west coast of India is in the vicinity of Kanhangad (Kanjangad), Kerala and Neeleeswaram, Kerala where the annular eclipse duration is the longest (3 minutes and 12 seconds). The best spot on east coast of India is near the village Ammapattnam, Tamil Nadu (duration 3m15s). Probably one of the best places in this list is Ooty (Udagamandalam) hill station. The altitude of 2200 meters will lead to better, unobstructed by the clouds, view of the eclipse. The Sun will be obstructed by the Moon more than 3 minutes. Tip: To find places with the longest annularity time, go to the city list below and sort it by the 'Annular Eclipse Duration'. The partial eclipse will begin few minutes past 8 (8am) of local time (IST - Indian Standart Time = UTC+5:30) and will end at about 11:30 IST (11:30am). Annular eclipse on the west coast begins 9:24 IST, on the east coast few minutes later - 9:31 IST . Annularity ends at 9:27 on the west coast and 9:35 on the east coast. What is an annular solar eclipse? Annular vs Total Solar Eclipse. Sun disc obscuration - Percent of the Sun covered by the Moon at the maximum eclipse. Annularity will occur in the area marked by the darkest red color (A).